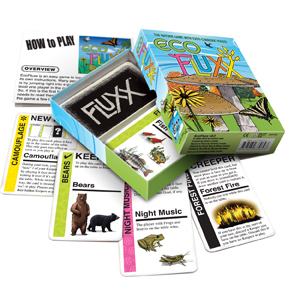 The game Nature Fluxx has replaced Eco Fluxx - it's the same game inside, just new packaging and a new name! In the wild, you must adapt to survive! Will you win by having your Bears Eat Fish? Or will someone change the Goal so that their Frogs and Insects can make Night Music? 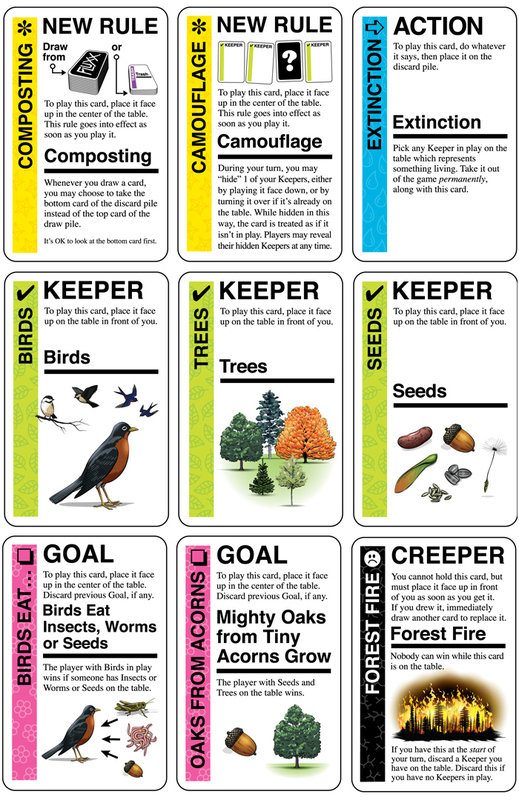 Play ecology themed Actions and Rules like Scavenger or Composting, but watch out for Creeper cards like Forest Fire, that can hurt everyone! 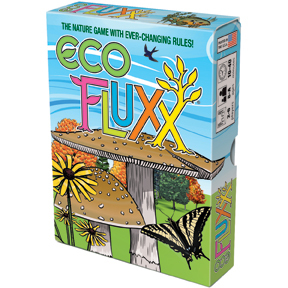 Discover a little about how things go together, with EcoFluxx - the nature game of ever-changing rules! It all begins with one basic rule: Draw one card, Play one card. You start with a hand of three cards... add the card you drew to your hand, and then choose one card to play, following the directions written on your chosen card. As cards are drawn and played from the deck, the rules of the game change from how many cards are drawn, played or even how many cards you can hold at the end of your turn. This ecological version of Fluxx introduces a new type of "Eats" Goal which demonstrate food-web connections, and three new Creepers representing natural disasters (Forest Fire, Drought, and Flood) which affect all players.